I have long been a follower of both Takei’s ardent activism and witty Facebook page. 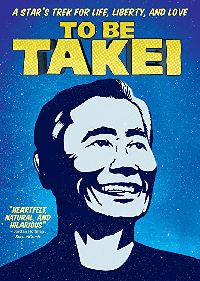 In To Be Takei, the actor opens his life and soul to the cameras to give viewers an inside view of his day-to-day life while looking back at his formative years and fight with typecasting as an Asian actor in Hollywood. Takei uses his affable, neurotic and very human personality to enlighten, educate and entertain. The counterpoint to his smiling and sometimes silly moments, Takei has a deep social consciousness and sees it as his responsibility to use his position as a public figure to advocate for causes dear to his heart. Just today, he released an eloquent statement regarding President-elect Trump’s tweet about jailing people who burn the American flag. George Takei is utterly heartfelt and delightful. He and Brad traverse their daily lives interacting and squabbling as you would expect people who have loved and lived with each other a long time to do. To Be Takei shows them in all ways as a wonderfully imperfect team. If nothing else, Takei’s marriage will remind viewers of the older generation in their lives and show that gay marriage is really just marriage. It always surprises me, as a history person, how many people don’t know that the U.S. Japanese Americans were interned during World War II. The California-born Takei and his parents (both born and raised in California) were taken to an internment camp when George was 5 years old. They remained behind barbed wire and under armed guard at a camp in Arkansas for three years because (as Takei says), “(They) looked like the people that had bombed Pearl Harbor.” He recalls going to school and pledging allegiance to the flag every day. When released, it was to find that his family had lost everything they’d built. I’ll tell you, readers, this viewer was in tears watching the invariably optimistic Takei recount his experience. Takei has every right, in the face of brutal discrimination, to harbor bitterness but he does not. Instead, he shares to act as an object lesson that we must guard against the ugliness of society that can lead to the victimization of the guiltless. It’s clear that Takei’s humanitarianism was born in the strong examples of loving parents. The discrimination Takei faced as a child carried over as a young actor faced with roles of ridiculous Asian stereotypes. His approachable inside look at the industry is without artifice and provides viewers a first-person look at an era where racism was considered humor and the movies were filled with Caucasian actors playing ethnic roles. Takei’s affection for Gene Rodenberry and the groundbreaking opportunities he provided are heart-warming. The one shadow in the experience perhaps is the chronicling of Takei’s long-standing feud with actor William Shatner. To Be Takei has a running time of 1 hour and 33 minutes and goes in depth on the issues discussed in this review and so many more. If you’re looking to be entertained and educated, To Be Takei is a must-see. Pick it up today. For more information about George Takei and his work, visit his website. You can connect with him on Goodreads, Facebook, Pinterest, YouTube, Google+ and Twitter @georgetakei.